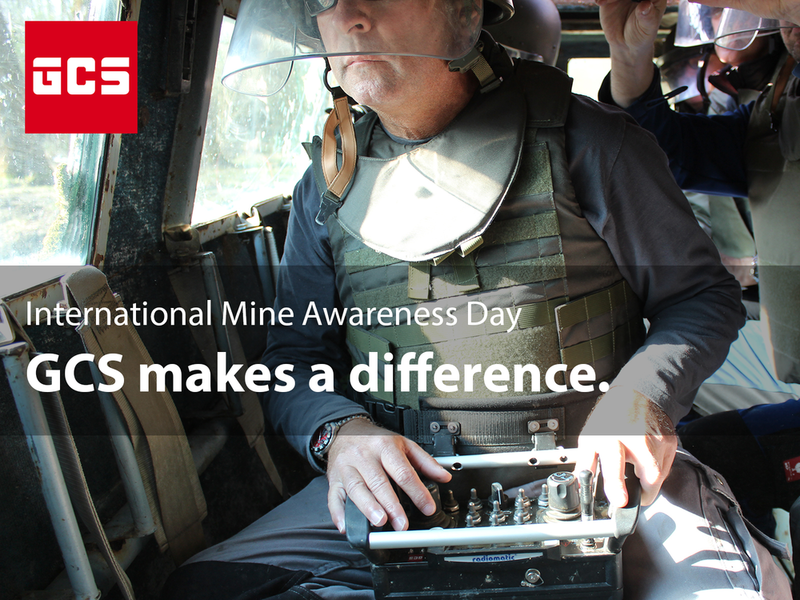 International Mine Awareness Day. GCS makes a difference. Every year, tens of thousands of civilians are killed or maimed by landmines and unexploded bombs worldwide. These indiscriminate hazards can remain in the ground, undetonated, for decades after hostilities have ceased, wreaking damage and hindering people from accessing their homes, limiting their movements, and preventing the land from being utilised. The UN declared that the 4th April should be observed each year as the International Day for Mine Awareness and Assistance in Mine Action to raise awareness of the ongoing threat posed by landmines. As GCS CEO Philipp von Michaelis says, "communities in conflict-stricken countries are affected by remnants of war 365 days a year: we have this one day to make the rest of the world aware of this fact." With over 30 years of experience, our GCS Explosive Ordnance Disposal (EOD) experts are working daily to remove explosive remnants of war in countries around the world. Alongside the provision of expert consultancy to militaries, law enforcement and international organisations, as well as a wide range of services such as Counter-IED training programs, GCS also produces state-of-the-art mechanical solutions. 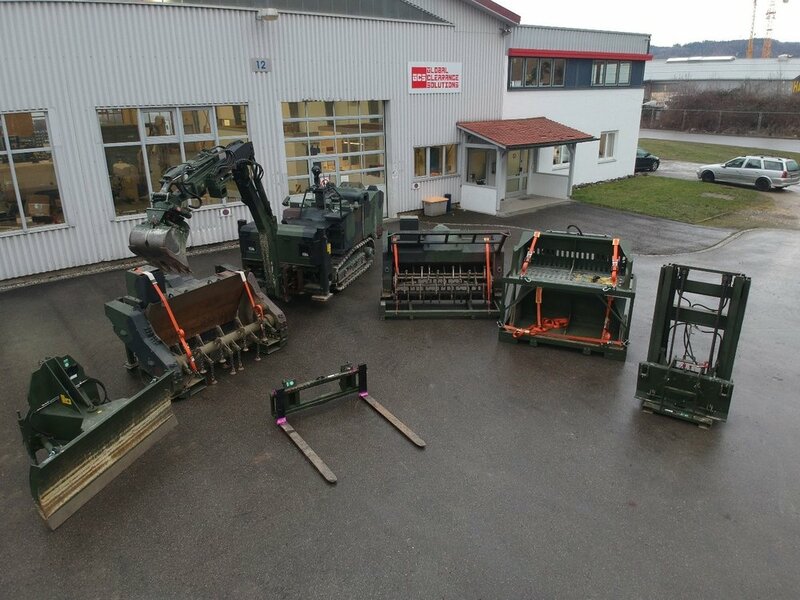 Our mechanical demining platforms deliver significant advantages over manual clearance - not only can more land be cleared, but the toll on human life is greatly reduced, as the process of manual demining is extremely dangerous. "Stabilization and reconstruction efforts in conflict-stricken countries require experts applying the latest methodologies and proven technologies to create safe environments," adds von Michaelis. In commemoration of this year’s Mine Awareness Day theme ‘Safe Ground’, GCS had the opportunity to test and demonstrate the maximum survivability of one of its remote-controlled tracked vehicles, the GCS-200. The testing took place at the Croatian Mine Action Centre – Centre for Testing, Development and Training (CROMAC-CTDT), where the GCS-200 faced several live mine test scenarios - 3 Anti-Tank (AT) and 19 Anti-Personnel (AP) blast and fragmentation mines, with some mines activated by pressure and others by tripwire or tilt rod. Performance tests were also carried out in different topology scenarios, e.g., sand, gravel, topsoil, as well as a vegetation clearance test. The GCS-200 effectively neutralised all of the mines in its path, with the help of the T-200 Tiller Attachment. There was minimal damage to the attachment from the blast and the successful result will lead to the accreditation certificate for GCS from CROMAC-CTDT. Our highly-skilled technician Chris Thompson was the operator of the GCS-200 during the tests. Chris has extensive on-the-ground experience in operating the machine, having most recently returned from Chad where he accompanied the GCS-200 on an arduous overland transport mission in the Sahara. Chris conducted a 4-week operator training program to the local staff of the NGO Humanity and Inclusion (HI - formally Handicap International). HI has been using the GCS-200 since February of this year, in order to speed up the demining process of creating ‘Safe Ground’ on 1.5 million square metres of land still estimated to be contaminated in the north of the country. Mine action saves lives, facilitaties the return to school of children and the return of safe land to farmers. It promotes economic and social development and makes it possible for citizens to live without the fear of these silent killers. Yet, mine action has a long way to go to tackle the fatal legacy of decades of prolonged conflicts. As von Michaelis says, "legacy minefields, as well as Improvised Explosive Devices from recent conflicts present enormous challenges to local communities and to the organisations tasked to neutralise these threats. It requires well-trained experts using suitable and tested technologies to render operations safe and cost-efficient". The seven systems were delivered in 2010/2011 and have given the German Army an urgently needed C-IED capability for the ISAF mission in Afghanistan. The systems were deployed in Afghanistan from 2011 to 2014 and have proven to be an effective tool in neutralising Improvised Explosive Devices (IEDs) laid by the insurgents. GCS is a long-time and trusted partner of the German Army and has fulfilled a number of maintenance contracts in recent years. Thanks to those contracts as well as an outstanding customer relationship, GCS plans to do the regular overhaul for a total of seven complete systems from the MineWolf 240 series until the year 2022. The systems consist of seven MineWolf 240 platforms with a variety of attachments as well as the required workshop infrastructure. GCS is an established provider of solutions to counter any kind of explosive and hazardous threats. The company has operations in many conflict theatres and offers a wide range of products to its customers worldwide. 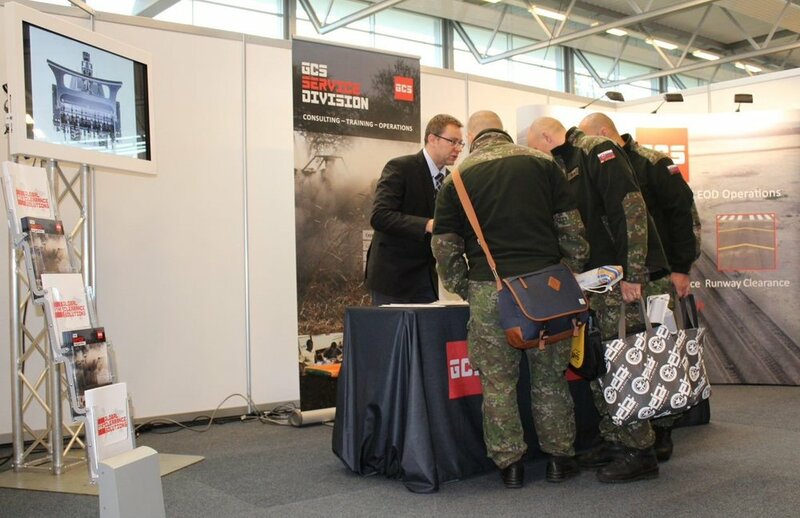 Amongst the 63 companies from 17 countries, GCS was present with its two multi-purpose platforms in the configuration for Counter-IED, Mine Clearance and Engineering Operations. The military experts were impressed by the versatility and robustness of our GCS-100 and GCS-200. Representatives of the German Armed Forces viewing the GCS-200 in the Mine Clearance configuration with our unique tiller attachment T-200. With the support of Kevin Kneebone, GCS is looking forward to rapidly entering the market. Having considerable experience working in this region, Kneebone states: "Iraq represents a substantial opportunity given the right technical and operational approach while also taking into consideration the unique operating environment. The variety of UXO, mines and IEDs is very challenging." Philipp von Michaelis, CEO of GCS, welcomes Kevin Kneebone to the GCS team: "Kevin brings a wealth of experience to the GCS team. Especially his experience in land and marine is a big asset for GCS. Therefore, we are happy to have Kevin also working on strategic topics and helping us to develop our business." GCS has taken on board one of Mine Action's recognized experts to further strengthen its operations: Ashley Williams (62), former CEO of Mechem, has joined the GCS team as Head of Operations as of October 1st 2018. Williams' expertise and track record will serve to develop new business opportunities and establish GCS as a full solution provider in the EOD and mine action sphere. 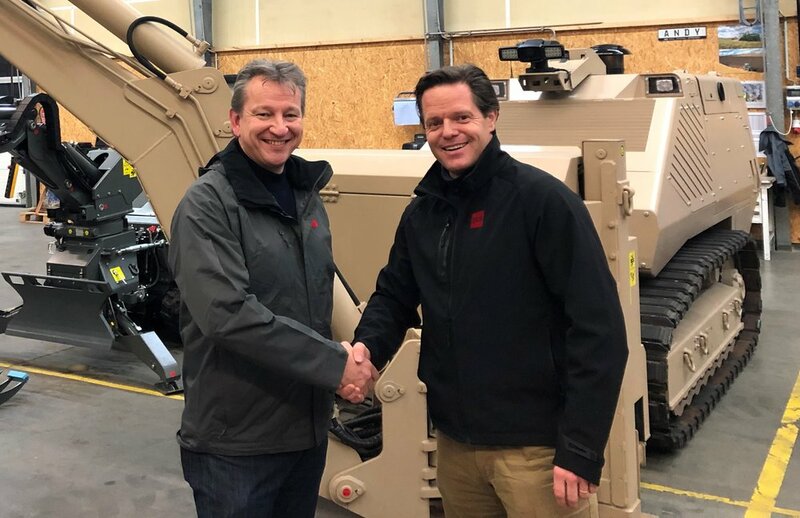 Philipp von Michaelis, CEO of GCS, confirms: "Ashley adds more than 40 years of experience in dealing with explosive remnants of war to our team and he has been involved in a huge number of mine action projects all over the world. He perfectly complements our organization and culture, we share the same values and are convinced that this will produce tangible and sustainable results." The greatest challenge will be to increase the recognition of GCS in this market, adds Williams. "The GCS brand is not yet well known but successful projects are delivered by people. The people behind GCS have a long track record in developing mine clearance technologies, as most of them used to work for MineWolf Systems, one of the pioneers in mechanical mine clearance. This know-how has been applied to develop the GCS range of products and the result speaks for itself. The extensive competence in implementing complex projects in some of the most hostile environments on this planet underlines our ambition to set a new standard in this industry." Williams has been involved in humanitarian and commercial mine action activities for 14 years. Prior to that he was active in the Engineering Corps of the South African Army for 28 years. His greatest motivation is to employ his know-how and experience to provide help to those that need it most. "It's not the sheer figures, it's not the number of mines that get cleared by our machines. It's the opportunity to provide a certain degree of normality to people's lives." He recites one of his memories from his long career: "A few years ago we cleared a mango field in Senegal which was heavily contaminated. We found 20 landmines – a great success! Still, the most rewarding result was to see the children playing in this field when we came back a year later." Global Clearance Solutions (GCS), the leading manufacturer of the remote-controlled mechanical demining machines, has received a conformity certificate by HCR-CTRO for its GCS-100 platform on September 04, 2017 in Zagreb. for mechanical demining of all types of antipersonnel (AP) mines to the depth of 15 cm. From August 28 - 30, 2017, HCR-CTRO conducted a trial of GCS-100 demining machine at Cerovac Test Site.